The 2019 BMW X4 doesn’t look like a revolutionary departure from the outgoing car, but I might finally be falling under the crossover spell because this thing actually seems kind of nice. BMW’s press release introducing the revised X4 is really selling the “crossover” concept of one-car-for-everything, bragging about the vehicle’s “perfect 50:50 weight distribution” and 19.4-degree ramp breakover angle. The 355 horsepower “budget X6” M40i model is still the top of the range, with a claimed 0 to 60 time of 4.6 seconds. Also launch control. And apparently a max water fording depth of 19.6 inches. The new X4 will be available in two variants: the afore mentioned M40i which starts at about $60,000 and an xDrive30i starting around $50,000. The smaller X4 is rated at 248 HP and 258 lb-ft of torque. Other significant updates include a standard navigation system running through a 10.25-inch touchscreen, a bigger HUD, more standard crash-preventing idiot-proofing, three-zone climate control and a nice new panoramic moonroof. The X4 grows about three inches in overall length to 187.5 tip-to-tail, and the wheelbase is stretched by 2.1 inches according to the manufacturer. 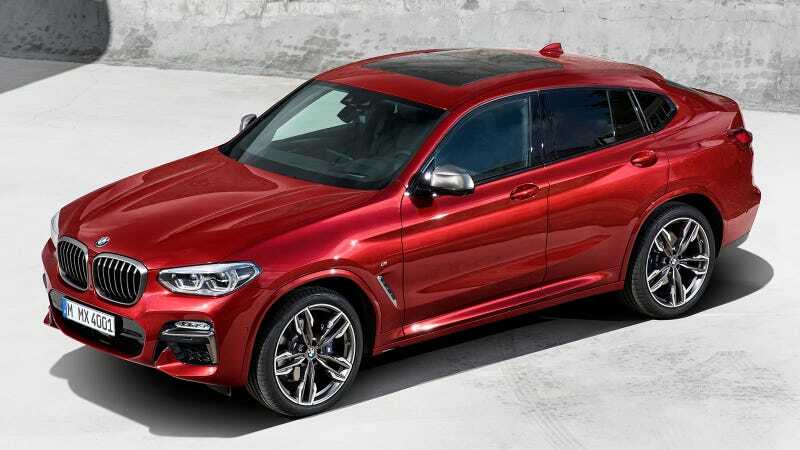 Besides the power, the M40i, which isn’t really a full M car, reportedly uses a rear-biased version of BMW’s xDrive all-wheel drive system plus extra-large (and of course colorful) M Sport brakes and Adaptive M Suspension which is electronically adjustable. Part of me wants to give up and embrace the crossover. If this car can be fun to drive, comfortable over suboptimal terrain (as close as anything with those wheels will get to “off-roading”) and practical who am I to argue with the hordes of humans who love these? Heck, from some angles, I dare say the design isn’t half-bad either.